In the peak years of 1852-1855, Victoria was producing most of the world's gold. At their peak, government gold escorts were often transporting a ton (1000 kilograms) of gold each week from places like Mount Alexander (now Castlemaine) to the Treasury and bank vaults of Melbourne. Today, amateur gold fossickers still comb Victoria for nuggets with metal detectors and pan for alluvial gold in streams. 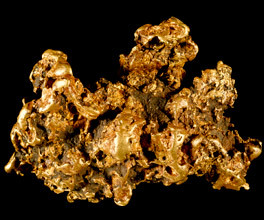 In 2006, a miner in Maryborough found a nugget weighing 110 ounces (3 kilograms). It was less than a metre below the surface. This wonderful nugget is about 20 inches long, by six or seven broad, and nearly as much deep [...] In shape, ¡t has a grotesque resemblance to a skeleton horse's head and shoulders [...] It bears upon its sides the marks of several hard blows from the pick. The Argus, 15 June 1858. The continued interest in guided tours, maps and the sale of metal detectors indicates that there is a quiet industry of small scale mining still active in the state. Considering that top public officials (like Gold Commissioners) were paid an annual salary of £500, it is easy to see that this was a find equal to any modern lottery win. But Ballarat's nugget would be surpassed 10 years later by the discovery of an even larger one in Moliagul, near Bendigo. The 'Welcome Stranger' was a mass of solid gold so large that it had to be broken up and weighed as three separate pieces. Even after finders John Deason and Richard Oates broke off chunks to give to their friends, it weighed 2332 ounces- more than 70 kilograms. The 'Welcome Stranger' was bought by a London bank for £19,000. It remains the largest nugget ever discovered. The largest known nugget in the world - still intact - is the ‘Hand of Faith.' Found in Victoria by a prospector with a metal detector in 1980, it was sold to a Las Vegas casino and is displayed in its lobby. The 27 kilogram nugget was sold for more than a million dollars that same year. Today, most Victorian miners focus on an area referred to as 'The Golden Triangle', an area east of Bendigo that takes in Avoca, Castlemaine, Wedderburn, Moliagul, Dunnoly and Maldon. Most modern finds probably go unreported. From the very beginning of the gold rushes, miners tried to keep rich areas secret for as long as possible.